Prime Minister Voreqe Bainimarama is leading a delegation to China for an official visit. He will hold talks this week with senior government officials and senior officials from China’s private sector. 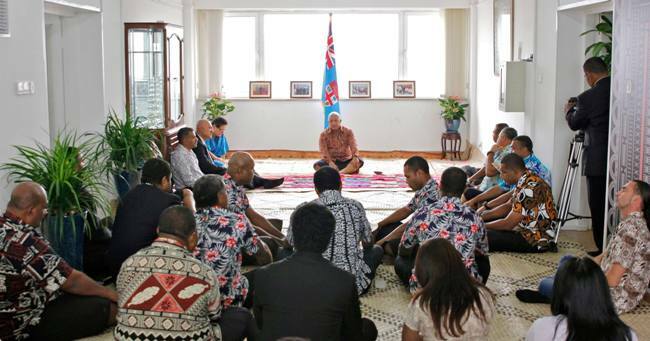 Bainimarama last night met with the Fijian community consisting of Fijian students, diplomats and workers living in China during his welcome ceremony. He also visited the Fijian embassy in Beijing and was briefed by the Ambassador Ioane Naivalurua on the work carried out by the mission to enhance relations between Fiji and China. He also met with more than 200 business officials who already have investment projects in Fiji. The Prime Minister also met with business persons proposing to invest in Fiji and highlighted Fiji’s position as an investor-friendly country. Bainimarama will later meet China’s President Xi Jin Ping this evening and hold separate bilateral talks with the Chinese Premier Li Keqiang tomorrow.